For treating anaemia and iron deficiency. Associated with improvements in cognitive function and cardiac insufficiency. Meets the increased needs of vegetarians and athletes. 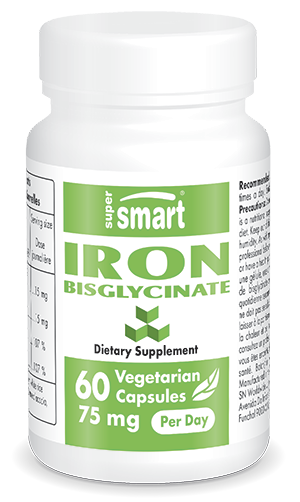 Our dietary supplement Iron Bisglycinate offers a simple way of increasing your iron intake. The body needs iron in order to function properly. This trace element participates in a number of mechanisms of action including the formation of new cells, hormones and neurotransmitters. Iron also plays an essential role in enabling red blood cells to transport oxygen from the respiratory system to the body’s tissues. This is why a lack of iron can be damaging to our health and why supplementation is sometimes necessary - particularly since serious iron deficiency can impair cognitive development and cause iron deficiency anaemia - a condition in which a lack of iron results in a reduction in red blood cells leading to poor oxygenation of the body. Iron deficiency has been a significant public health issue for several years. The World Health Organisation (WHO) estimates that 1.3 billion people suffer from iron deficiency anaemia. Of the many potential causes, the most common is inadequate intake, or poor absorption, of dietary iron. The body does not produce iron and it must therefore be provided by the diet. It is found mainly in animal-source foods, hence the need for vegetarians and vegans to find alternative sources. A lack of dietary iron is also common among women, particularly during pregnancy. Indeed, women of reproductive age have increased iron requirements because their levels are more subject to depletion. It is estimated that iron levels may fall by up to 25% during menstruation and pregnancy. However, iron deficiency may be caused by other factors such as intestinal malabsorption, gastrointestinal bleeding or gastric surgery. These symptoms are associated with poor oxygenation of the body, both in muscles and in several organs such as the brain, heart, kidneys and lungs. Scientists have also observed that a lack of iron can lead to learning difficulties and poor concentration. This is why supplementing with iron may help improve cognitive ability and prevent heart failure. Our dietary supplement Iron Bisglycinate is formulated from a specific form of iron – iron reacted with glycine to form a chelate called ferrous bisglycinate. This has the advantage of being an anti-fatigue form of iron with excellent bioavailability due to its low molecular weight. It is thus easily absorbed by the gut, making it bioavailable within the body. In addition, ferrous bisglycinate is a stable form of iron. Having no ion charge, it does not interact with other nutrients in the digestive system and is therefore well-absorbed by the body. The ferrous bisglycinate used in our supplement is a safer, more effective form than either ferrous sulphate, iron citrate or iron D-gluconate, all of which can produce side-effects such as gastric problems. Studies on ferrous bisglycinate, on the other hand, have revealed no negative side-effects on the stomach wall or intestines. The benefits of this type of iron are now available as dietary supplements in the form of 25g capsules, with a suggested dose of three capsules a day for optimal iron intake.